We tend to like our fish simply prepared - that's the way we think it tastes best. Most important, regardless of the recipe, START WITH REALLY FRESH, GOOD QUALITY FISH. I've told the story many times, but to summarize, a woman came into one of our stores years ago, tasted a recipe we'd made, picked up the recipe. She came back a week later, complaining to our culinary person that our recipe was faulty. Our employee went through everything with her, step by step, couldn't find a problem. Finally, she asked "did you buy the fish from us?" and the woman said no, she got it cheaper at the grocery store. Our exasperated employee said "we don't guarantee our recipes with someone else's fish!" No matter what you do to bad fish, it won't taste good. If the fish is really cheap, chances are it's either thawed out or from China. Or both. GRILLED FISH: We love salmon on the grill, but we also enjoy the heck out of mahi mahi, ono, swordfish and halibut on the grill. I just rub the fillets or steaks with a little olive oil, sometimes a little salt-free spice rub, and cook 10 minutes per inch of thickness over medium high heat, starting with the flesh side down first, flipping over to the skin side down. The fun part comes at the end, when I flip the fish for side two. That's when I add some of our fresh pesto - I spread it on with a spatula - so it heats up and melds with the fish during the last few minutes of cooking. All of our pestos taste good with any of these fish - it's just enough fresh flaovor to add to, but not mask, the taste of the fresh fish. When I use a spice rub with kick to it, like some of the Cajun ones, I counter the spiciness with Tropical Salsa - or just slice some papaya, fan it out over the fish, and sprinkle chopped cilantro over the top - pretty and easy to do. We also love shrimp on the grill - one of my favorite marinades is on our web site - it contains garlic and fresh basil, (hence the name, Garlic Basil Shrimp) and you just put everything into a blender and mix it up. Easy peasy. 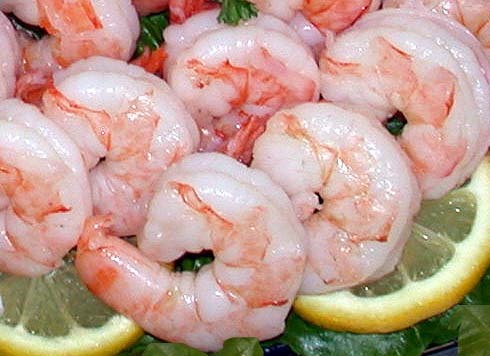 To find all of our delicious shrimp recipes, CLICK HERE. Small skewers of this shrimp can be a great appetizer, bigger skewers a great main course with some rice pilaf and a salad. This is a simple recipe to do in the oven or on foil on your grill. Choose your favorite herbs – we suggest a blend of thyme, fennel greens and oregano, but any of your favorite herbs will work. Serve with our Herb Roasted New Potatoes and Garlic Green Beans. Lay a piece of heavy-duty foil on a Tony pan or rimmed baking sheet. Arrange lemon slices in two layers in the center of the foil. Spread herb sprigs over the lemons. Place the salmon on the herb sprigs. With the side of a chef’s knife or a pestle and mortar, mash garlic with salt to form a paste. Transfer to a small dish and stir in mustard and the remaining 2 tablespoons chopped herbs. Brush the mixture over both sides of the salmon. 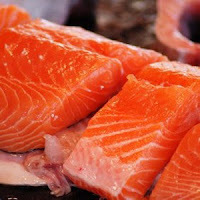 Cook until the salmon is opaque in the center, 10 to 14 minutes. Serve with lemon wedges (discard herb sprigs and lemon slices). SAUTEED FISH. The two fish that I love to saute are fresh lake perch - I dredge it in seasoned flour, dip it in egg & milk mixture, and saute in olive oil for about one minute per side over medium high heat. 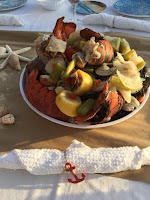 I serve it with lemon wedges and Burhop's Tartar Sauce - just a great dinner. My other saute favorite is Nut Crusted Ruby Red Trout - just grind up 1/4 cup of nuts in the blender - we like pecans, but almonds or pistachios are good too (and if you want to get fancy, add some chopped dill) - rub the fillets with a little olive oil, press the ground up nuts into the fillets. I use olive oil, and saute the fillets nut-side down first, then flip to the skin side. I add a little of our Lemon Dill Sauce, or a squeeze of lemon. So easy, and great for entertaining - most people have no idea how easy it is to nut crust a piece of fish! If you try any of these preparations, let us know how you like them! Not all wild-caught fish is the same for many reasons. It's hard for the untrained consumer to see the difference, but generally they can taste it. We only buy restaurant-quality fish, which is usually from day boats, not the giant trawlers that supply grocery chains. The big boats stay out for days, even weeks, and the fish is processed on the boat. Before it's processed, it's in giant holds, where the fish on the bottom is pretty much crushed. Grocery stores order tens of thousands of pounds of fish, they mostly don't even consider where it comes from or how it's caught, they just want lots of it at a cheap price. Exactly how fresh can fish be that's been on a boat for 2 weeks? Much of the fish that's in grocery fresh cases is fish that was previously frozen. (Read the tiny print.) There's nothing wrong with fish that's been frozen right after being caught, but it should be left frozen. Once it's been frozen, thawing starts a rapid deterioration of the fish, and the fish should be cooked immediately, not left sitting in a fish case for days. We generally get whole fish which we process ourselves. We want to look at the eyes, to see if they're clear, and can smell whether the fish is truly fresh. Our fish doesn't sit in a distribution center somewhere, it comes from our suppliers on both coasts, gets picked up at the airport and put in our cases the same day. To offer the quality that we offer, we have to pay our suppliers more. Yes, you can get cheaper fish at the supermarket. But don't you care what it tastes like?? Saving a few bucks on fish nobody wants to eat is not good economics. Kebabs are one of my favorite things to make when we're entertaining in the summer - they're visually appealing, easy to make in advance, and they cook quickly on the grill. When we had a wedding party for our daughter last summer, we served several kinds of kebabs which were marinated and ready to cook when dinner time arrived. We had salmon kebabs, marinated in Burhop's Herb Garden Marinade, swordfish kebabs marinated in Burhop's Tahitian Marinade, tuna kebabs marinated in our Shoyu Oriental Marinade, and shrimp kebabs in my own garlic basil marinade, recipe below. We also had a few chicken kebabs for non-fish eaters, just in case. All the ingredients were pre-cut, the fish by Burhop's staff, the veggies by my raft of helpers, even the bride. We used green, red and yellow peppers, red onion, cherry tomatoes and mushrooms with the fish (and chicken) kebabs, the shrimp were on their own. We soaked the wooden kebab sticks in water for an hour before the party started, and my two catering lady helpers assembled the kebabs when they arrived, and put them in the various marinades while guests downed a lot of appetizers. We had large containers from the store to hold the fish, which were great for marinating - we just took them back after the party. Then Jaime came from work and grilled everything to perfection - he is absolutely great at parties, let us know if you want to hire him for yours! 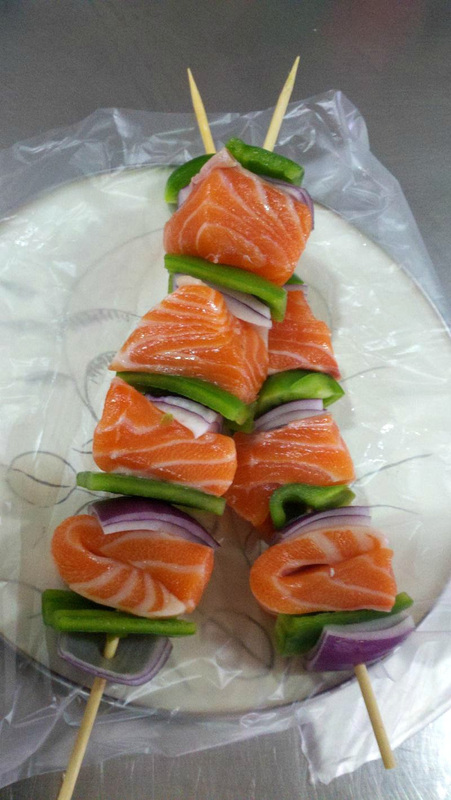 Of course, you can also just get all the kebabs ready made from Burhop's - we happily do them to order. Cut bacon strips into squares and saute until partially cooked. Don't let it get too crisp, or it will break when you try to put on the skewers. (Remember bacon will shrink when cooked). Build kebabs starting with a square of pepper, a chunk of onion, a piece of bacon, a scallop, another piece of bacon. Repeat, ending with a piece of green pepper to hold everything together. If you are doing 4 kebabs with 3 scallops each, you will need 24 squares of bacon. Brush with olive oil and grill (or broil) for a total of about 5 minutes over medium high heat, turning once. Serve with a drizzle of Lemon Dill, some wild rice or Herb Roasted Potatoes and an heirloom tomato and basil salad. And here's my favorite grilled shrimp kebab recipe. Directions: Mix the marinade ingredients in a blender or food processor until it looks well combined. Add chili flakes as desired for how much “heat” you prefer. Mix marinade with shrimp in a glass or ceramic bowl and refrigerate for up to an hour. 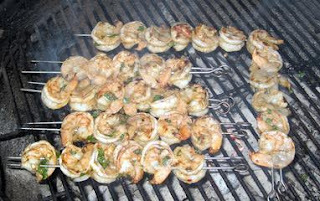 Put shrimp on skewers (I used 2 skewers for the kebabs in the photo - it makes them easier to turn) and grill over medium high fire or broil for about 5 minutes total, watching and turning as needed. Serve with a chilled glass of rose or Sauvignon Blanc . Every summer, when the farmer's market starts having most of the fresh ingredients for my favorite Salad Nicoise, I make a big one, and we have it for dinner and then lunch the next day. It's great for entertaining, because you can make the whole thing before your guests arrive and keep it in the fridge until you're ready to serve it. 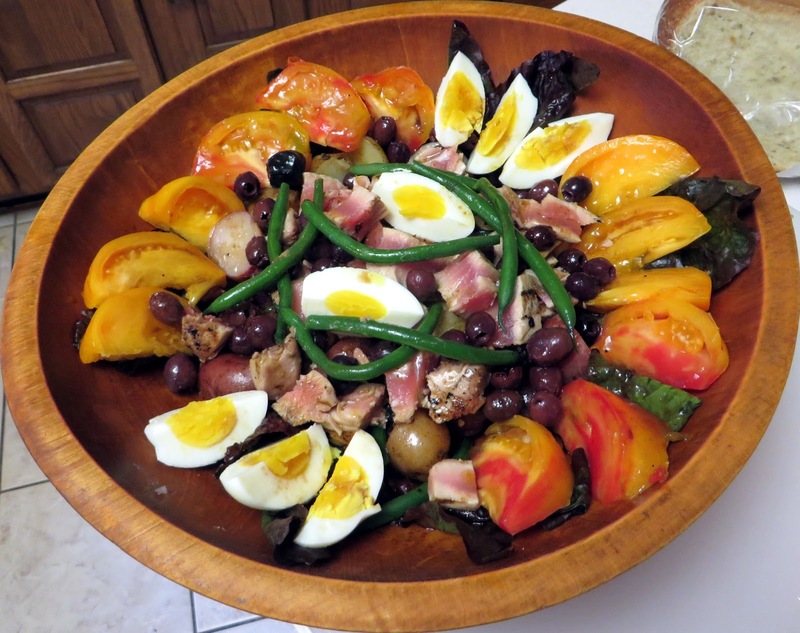 This is a layered salad, not a tossed salad - all of the ingredients should be visible. 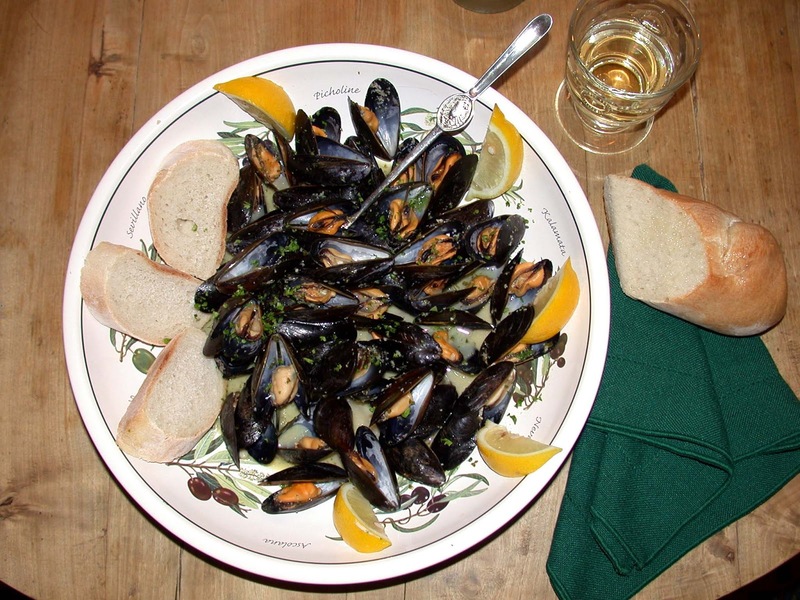 With a nice bottle of wine and some crusty bread, you can close your eyes and picture yourself on the French Riviera. Only the French could make potato salad this scrumptious. For the dressing: Whisk the vinegar, mustard, and a large pinch each of salt and pepper in a medium, glass or non-metallic bowl until combined. Whisk in the olive oil in a slow, steady stream. Stir in the herbs, taste, and season with more salt and pepper as needed; set aside. Sear and bake the fresh ahi or albacore tuna so that it is still a little pink on the inside. A 1” thick piece of tuna will require 1 minute of searing each side, then another 3-4 minutes in a 425° oven. Or grill for 2 minutes per side. Set aside. (Fish will continue cooking, so err to the rare). blanch until tender but still crisp, about 2 to 3 minutes. Drain and rinse under cold running water until cool. Spread the beans on paper towels and let them sit until dry. When the potatoes are ready, slice them in half. Place in a small bowl and toss with just enough of the dressing to lightly coat. Taste, adding more dressing, salt, and pepper as needed; set aside.Slice each egg lengthwise into quarters and set aside. Place the green beans, tuna, and tomatoes in separate small bowls. Toss with just enough of the dressing to lightly coat. Taste, adding more dressing, salt, and pepper as needed; set aside. Arrange the lettuce in a large wooden or ceramic salad bowl. Place the potatoes in the center of the lettuce, then the tomatoes, crumbled tuna and green beans over the potatoes. Top with the anchovy fillets, egg quarters and olives. Serve immediately and, if you choose, with remaining dressing on the side. For years when our kids were little, we would spend a couple of weeks in Door County, Wisconsin, at a wonderful little cottage we owned with the fish husband's family. Our kids loved going to Al Johnson's and seeing the goats on the roof, having dinner and bowling at the Sister Bay Bowl, getting ice cream at Wilson's, and going to a fish boil or two. Our favorite was at the White Gull Inn, where they provided hot dogs for all the kids who didn't eat fish (our kids never touched the hot dogs). After a hard day of playing on the beach, hiking and biking, our son Greg would chow down on an enormous helping of fish and potatoes, then happily go to sleep with his head on the table. Peel onions. Clean potatoes (DON'T PEEL) and cut small circle off ends. Remove the basket from the kettle, and place potatoes and 8 qts. of water in pot. Bring to a boil and add spice bags, salt and onions. Cook for 15 minutes at a steady, rolling boil, with the top of the kettle vented or partly covered. Stack fish in basket and add to the kettle when potatoes are almost done. Be careful about overflow - you may have to ladle out a little water. Cook fish for 12 minutes, with pot partially covered. Take pot to sink and drain fish. Serve family style on big platters for a back yard party, or serve directly onto plates, as you prefer. Top the fish, potatoes and onions with a couple of tablespoons of hot melted butter and some chopped parsley, and serve with lemon wedges and Burhop's Cole Slaw. The reason why they do a flame off at the end up in Door County is because of the quantity of fish. (For those of you who have't seen one, the fish boil is cooked outside over a fire, and at the end of the cooking, an accelerant is thrown on the fire, causing it to flare up and the cooking water to overflow onto the fire). The purpose of the flame off is to get rid of the oil etc. that floats to the surface when you have 30 or 40 lbs. of fish. With this amount of fish, draining it works just as well, and it's a lot safer. Not as spectacular, but safer. We haven't done one of these in years, but remembering how delicious it is, I think it's time we did it again. This time of year, there are many great farmers markets, where you can get wonderful fresh onions and potatoes for the boil. Invite some friends over and have a Door County Fish Boil party!